Prolonged release Tablets: Box of 30. Each tablet contains: Alfuzosine HCl: 10 mg. Excipients: lactose monohydrate, hypromellose (E464), povidone K25, magnesium stearate (E470b). In benign hyperplasia of the prostate, the functional disturbance is not caused solely by the enlarged prostate gland, but also by the stimulation of nerves which in turn cause increased tension in the smooth muscle of the lower urinary tract and thus lead to problems when urination. By blocking the transmission of this nerve stimulation in the region of the prostate, Alfuzosine HCl brings about a relaxation of this tension and therefore makes it easier to void the urine. 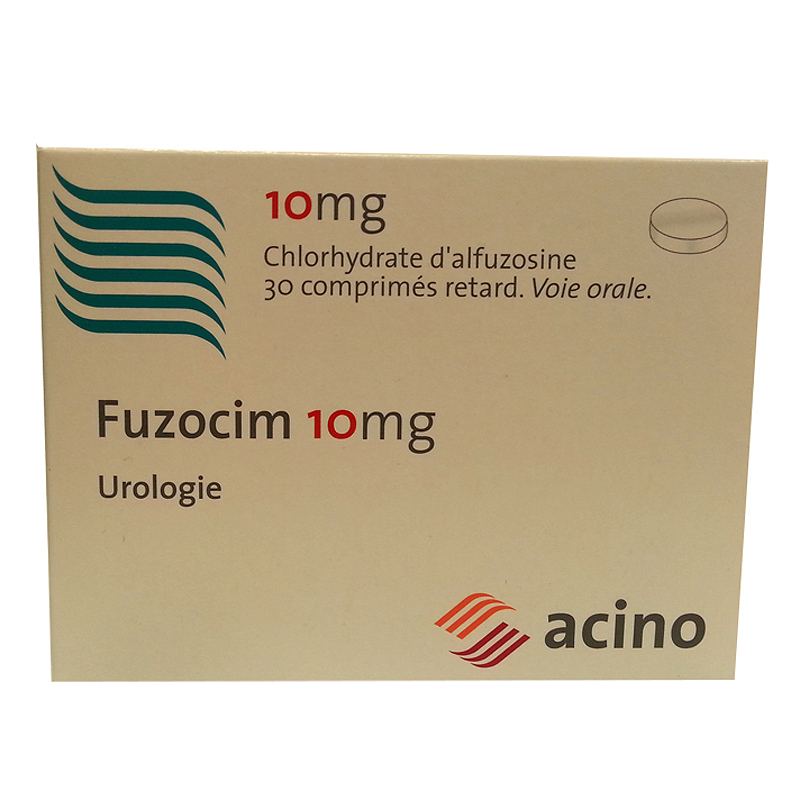 Fuzocim 10 can be used to treat the symptoms of prostatic hyperplasia. Hypersensitivity to this product or to one of the ingredients. History of orthostatic hypotension. Liver disorders. Cardiovascular side-effects: Certain people have a particular sensitivity to Fuzocim 10 which manifests itself in orthostatic hypotension. This phenomenon, which can occur in the first few hours after taking the medicine, is preceded by a feeling of dizziness, outbreaks of sweating and signs of tiredness, and may become as severe as loss of consciousness. In this case, the patient should lie down with legs raised until these temporary phenomena have disappeared completely. Take great care when driving a vehicle or operating machinery because reactions may be impaired, especially at the start of treatment when there is a risk of dizziness and a drop in blood pressure. This question does not arise on account of the intended use of Fuzocim 10. A doctor must ne consulted if any other unusual effect occurs during treatment, such as e.g. drowsiness, attacks of weakness, itching, appearance of pustules, palpitations, pains in the chest, swelling of the arms or legs, orthostatic hypotension, fainting attacks. For the treatment of symptoms of prostatic hyperplasia: Basically, take one prolonged release tablet daily after a meal, preferably prior to going to bed. Keep at room temperature (15-25C).